The domain within your query sequence starts at position 898 and ends at position 910; the E-value for the AT_hook domain shown below is 1.41e2. Small DNA-binding motif first described in the high mobility group non-histone chromosomal protein HMG-I(Y). 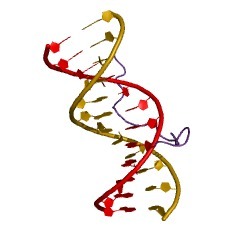 AT hooks are DNA-binding motifs with a preference for A/T rich regions. 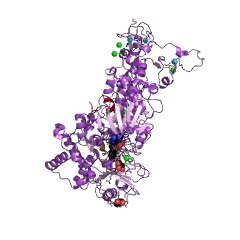 These motifs are found in a variety of proteins, including the high mobility group (HMG) proteins [(PUBMED:11406267)], in DNA-binding proteins from plants [(PUBMED:8790293)] and in hBRG1 protein, a central ATPase of the human switching/sucrose non-fermenting (SWI/SNF) remodeling complex [(PUBMED:17081121)]. There are 76954 AT_hook domains in 42187 proteins in SMART's nrdb database. Taxonomic distribution of proteins containing AT_hook domain. This tree includes only several representative species. The complete taxonomic breakdown of all proteins with AT_hook domain is also avaliable. Click on the protein counts, or double click on taxonomic names to display all proteins containing AT_hook domain in the selected taxonomic class. The fission yeast homologue of Orc4p binds to replication origin DNA via multiple AT-hooks. The origin recognition complex (ORC) was originally identified in the yeast Saccharomyces cerevisiae as a protein that specifically binds to origins of DNA replication. Although ORC appears to play an essential role in the initiation of DNA replication in the cells of all eukaryotes, its interactions with DNA have not been defined in species other than budding yeast. We have characterized a Schizosaccharomyces pombe homologue of the ORC subunit, Orc4p. 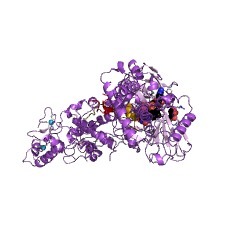 The homologue (Orp4p) consists of two distinct functional domains. The C-terminal domain shows strong sequence similarity to human, frog, and yeast Orc4 proteins, including conserved ATP-binding motifs. 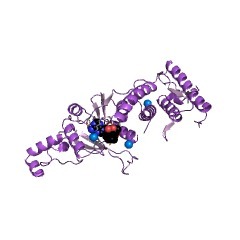 The N-terminal domain contains nine copies of the AT-hook motif found in a number of DNA-binding proteins, including the members of the HMG-I(Y) family of chromatin proteins. 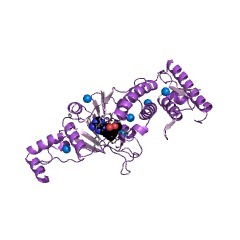 AT-hook motifs are known from biochemical and structural studies to mediate binding to the minor groove of AT-tracts in DNA. Orp4p is essential for viability of Sc. pombe and is expressed throughout the cell cycle. 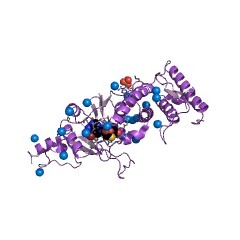 The Orp4 protein (and its isolated N-terminal domain) binds to the Sc. pombe replication origin, ars1. 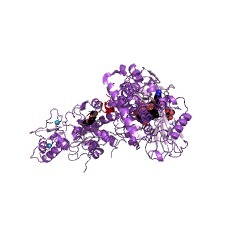 The DNA binding properties of Orp4p provide a plausible explanation for the characteristic features of Sc. pombe origins of replication, which differ significantly from those of Sa. cerevisiae. The solution structure of an HMG-I(Y)-DNA complex defines a new architectural minor groove binding motif. 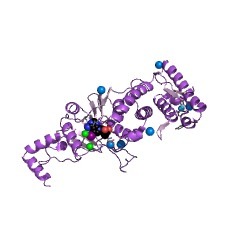 The solution structure of a complex between a truncated form of HMG-I(Y), consisting of the second and third DNA binding domains (residues 51-90), and a DNA dodecamer containing the PRDII site of the interferon-beta promoter has been solved by multidimensional nuclear magnetic resonance spectroscopy. The stoichiometry of the complex is one molecule of HMG-I(Y) to two molecules of DNA. The structure reveals a new architectural minor groove binding motif which stabilizes B-DNA, thereby facilitating the binding of other transcription factors in the opposing major groove. 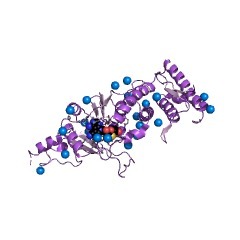 The interactions involve a central Arg-Gly-Arg motif together with two other modules that participate in extensive hydrophobic and polar contracts. The absence of one of these modules in the third DNA binding domain accounts for its-100 fold reduced affinity relative to the second one. Evolution of a fungal regulatory gene family: the Zn(II)2Cys6 binuclear cluster DNA binding motif. 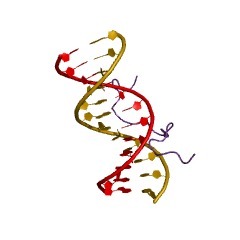 The coevolution of DNA binding proteins and their cognate binding sites is essential for the maintenance of function. As a result, comparison of DNA binding proteins of unknown function in one species with characterized DNA binding proteins in another can identify potential targets and functions. The Zn(II)2Cys6 (or C6 zinc) binuclear cluster DNA binding domain has thus far been identified exclusively in fungal proteins, generally transcriptional regulators, and there are more than 80 known or predicted proteins which contain this motif, the best characterized of which are GAL4, PPR1, LEU3, HAP1, LAC9, and PUT3. Here we review all known proteins containing the Zn(II)2Cys6 motif, along with their function, DNA binding, dimerization, and zinc(II) coordination properties and DNA binding sites. In addition, we have identified all of the Zn(II)2Cys6 motif-containing proteins in the sequence databases, including a large number with unknown function from the completed Saccharomyces cerevisiae and ongoing Schizosaccharomyces pombe genome projects, and examined the phylogenetic relationships of all the Zn(II)2Cys6 motifs from these proteins. Based on these relationships, we have assigned potential functions to a number of these unknown proteins. This information is based on mapping of SMART genomic protein database to KEGG orthologous groups. 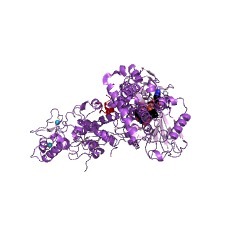 Percentage points are related to the number of proteins with AT_hook domain which could be assigned to a KEGG orthologous group, and not all proteins containing AT_hook domain. Please note that proteins can be included in multiple pathways, ie. the numbers above will not always add up to 100%.